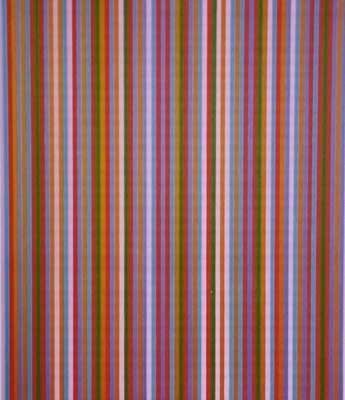 Although Riley’s reputation is always connected with her pioneering black and white ‘op art’ paintings of the 1960’s, the range of colour, and thus the scope of her work, has since been steadily growing. In 1978-1980, a large retrospective of her career was toured extensively around the world and this gave the artist the opportunity to travel. Her experience of Australia, and particularly a visit to Egypt, brought her into contact with a huge bank of colour sensations on which to draw, and this began to make itself felt in the paintings produced in the early years of the new decade. Whilst the previous paintings had become ever more complex in their composition, the demands of the wider palette marked a return to the pure simplicity of the equally modulated striped form. Within this, Riley was able to experiment with the effects produced by the various colour combinations and the visual sensations thus experienced. Certain colours form key elements in works of this period, although she still used both white and black extensively, black to give a strong ‘beat’ to the image and white to echo and balance that note, and yet give a kind of framework within which the possibilities of the remaining colours can be utilised. When the black bands began to disappear in the paintings from 1983 onwards, the softer manipulation of the areas between them by the white stripes allowed still further development for the creation of spatial depth.